Through always seeing the same chocolate bars a bit everywhere in the shops or self-service machine, we’re tending to think what means chocolate bar also means “sugar level getting crazy”, “this is not good for my weight”, “oops I must to go for a run now”. One of the first things I wanted to do when I stopped sugar for 8 weeks was to find other ways to eat that kind of snacks without the cons that are usually packed with. It was also the good opportunity to finally try to make real sugar free chocolate, without all the additives that we are used to see on packs, but more benefits for our health. 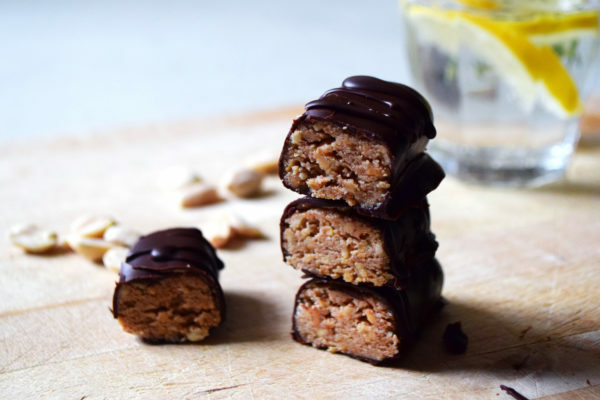 In addition to magnesium, which is naturally present in real cacao, those sugar free snacks are super easy and quick to make as they are mainly composed by peanut butter – the real one, with neither added sugar, nor salt, nor added fats -, coconut flour and raw cacao. The natural peanut butter is also well-known for its inputs in proteins, which make enables those sugar free chocolate bars the be the ideal snacks in case of munchies, or even before or after a sport session. 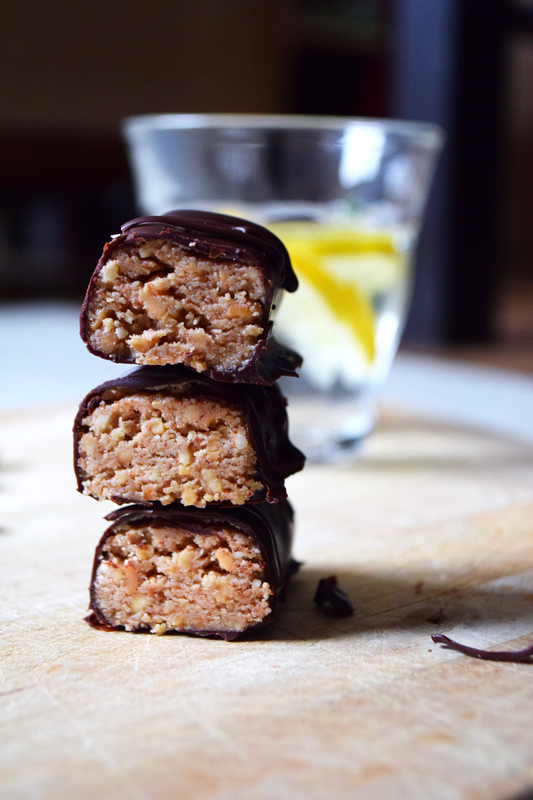 Even though I’m quite happy with the final result and the ease to make the protein bars, I’ll probably improve the recipe and edit this post later. 1. Prepare the peanut and coconut filling: in a bowl, mix with a fork the peanut butter and the coconut flour together. Keep going until you get a supple and homogeneous dough, which neither stick nor crumble. 2. Take some small balls from the dough, then roll them delicately between your hands to shape some small sausages, slightly rectangular. Arrange them on a small tray or grid. Put in the freezer for about 15 minutes, meanwhile you prepare the chocolate cover. 3. In a small pan on a low heat, let melt the cacao butter and the coconut oil. Add the raw cacao powder once the fats are melted and stir well. Wait until it gets tepid in order to have a thicker texture. 4. Take off the bars from the freezer. With a fork, let them take a bath one by one in the cacao cover. Dust each of them with a pinch of Himalaya salt - or not, for people who don't like it - straight after to take them off from the bath: as the bars are very cold, the frosting is getting solid in only a couple of seconds. 5. 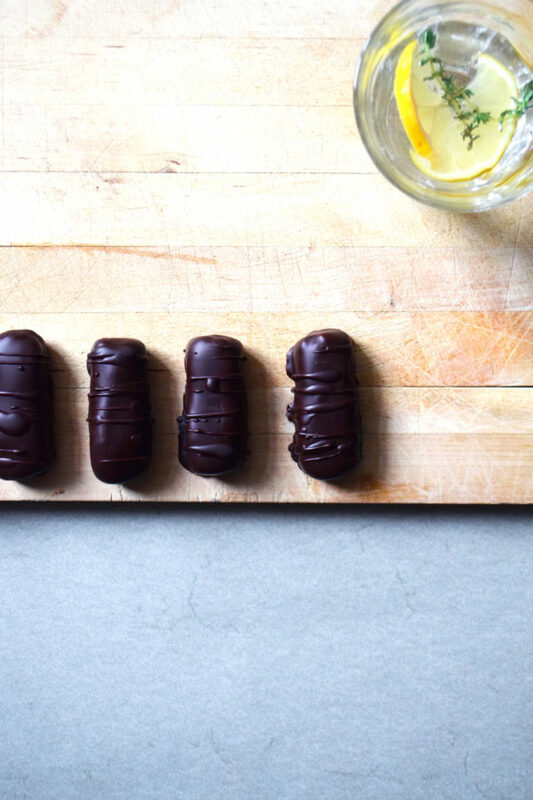 Keep the bars in the fridge to avoid that the chocolate cover melts - the coconut oil is very sensitive to temperature -.